Time to get out the safety scissors and start eating the glue, because this looks like a lot of fun! 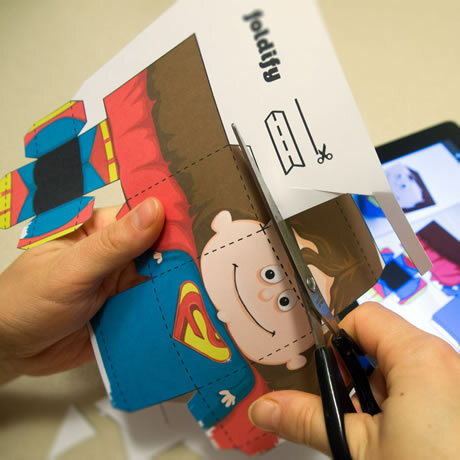 Foldify is a really neat app for iPad that allows you to directly paint a design onto a choice of simple 3D shapes, which can then be printed, cut, folded and glued. The app also offers a gallery of contributions from other users which can be printed direct from the app. Whilst other people have been doing foldable characters for a while - e.g.Cubeecraft - this is all about the elegant interface, which gives you a real time 3D preview of the completed shape as you paint in 2D, and the fact that it features several other primitives to paint onto, like cars, spheres and pyramids.